SAP Fiori 2.0 is the user experience for SAP S/4HANA 1610 – you can access all applications via the SAP Fiori launchpad, and they all have one look via the SAP Fiori 2.0 visual theme: SAP Fiori apps as well as classic SAP GUI and WebDynpro applications. For most business roles in SAP S/4HANA a combination of newly designed SAP Fiori apps and classic applications are needed to cover the full variety of a user’s tasks. SAP S/4HANA 1610 now provides SAP Fiori launchpad content for more than 100 business roles. The roles combine in a meaningful manner SAP Fiori apps and classic applications, visually harmonized with the SAP Fiori 2.0 Belize theme, and serve as a template for customer implementations of the SAP Fiori launchpad. We have defined more than 7.000 app descriptors, which enable administrators to integrate classic applications with the SAP Fiori theme into business catalogs and roles for the SAP Fiori launchpad. 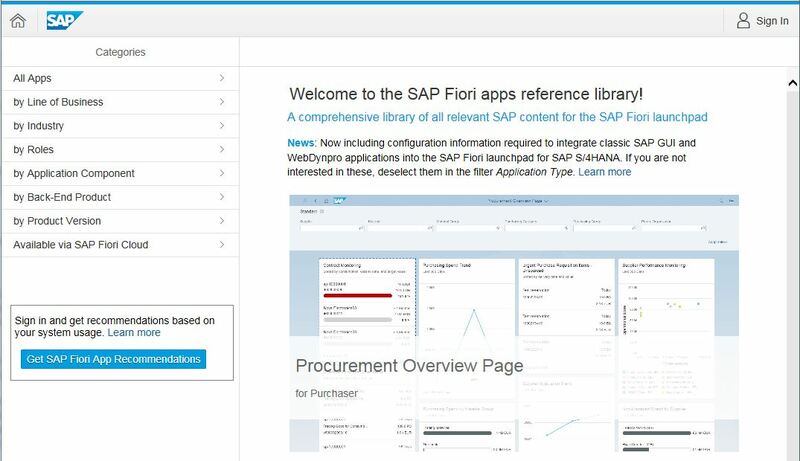 Over the last weeks and months we have received an increasing number of requests from customers and partners to extend the SAP Fiori apps reference library to include information about all the content included in the SAP Fiori launchpad for SAP S/4HANA 1610: so that they can see what content is available for each business role, and so that they can easily find relevant configuration information to integrate classic applications into the SAP Fiori launchpad. By providing this content in the SAP Fiori launchpad and in the SAP Fiori apps reference library, customers can easily set up the SAP Fiori launchpad as the central access point for SAP S/4HANA 1610 users, so that they fully benefit from having a single point of entry to SAP Fiori apps and classic applications, and also benefit from having a harmonized visual experience via the SAP Fiori 2.0 Belize theme. In order to quickly accommodate the above customers’ request, we extended the SAP Fiori apps reference library by adding the application type “SAP GUI”. With this, you can see all the content contained in the SAP Fiori launchpad for SAP S/4HANA 1610. If you are only interested in what was shown prior to our adding the application type “SAP GUI”, then use the filter feature: choose the filter Application Type, then mark the check box next to Select All and then deselect the entry SAP GUI. The decision to apply the Fiori theme to our classic UIs in no way means that we are abandoning the SAP Fiori design principles nor our commitment to SAP Fiori as the UX of SAP products. If anything this allows us to focus more strongly on building new Fiori apps to enable new ways of working; including conversational UI, machine learning, immersive experiences, etc. To find out more about SAP Fiori 2.0 for SAP S/4HANA, its benefits and also the implications if you upgrade, please take a look at this overview document: SAP Fiori 2.0 – What you need to know. Thanks Maricel. As someone currently implementing S/4HANA 1610 with Best Practice content for Australia I’m already finding having both the GUI transactions & the Best Practice specific business roles listed in the Fiori Apps Library very helpful in activating & tailoring the Fiori Launchpad. thanks for the hint. However I am experiencing a massive performance issue on different browsers / machines. I tried to export a standard list of all 7020 apps (mostly GUI) listed for S/4HANA 1610. However I receive an out of memory in Google Chrome and no feedback from the Internet Explorer after I selected the apps, choose “Aggregate” and then switched to list view in order to export as an Excel file. Do you have any suggestions to export the data? Is there any workaround to export the data to a file? Aggregate view and List view are alternative views. Just go directly to List View, select the view variant (Overview, Installation Details or FLP content) and press download. You can also configure the view on your own and save as variant. If you still face issues, please use the Contact Us feature in the library. I’ve just tried the aggregate view and selected the 7043 apps for S/4HANA. After some waiting time I was able to download the lists of ICF Nodes for UI5 and WebDynpro and also the oData Services. I’m using a Mac with 16 GB RAM and Google Chrome. thanks for your hint. I have managed to extract the information using my own computer at home but not on the controlled devices of my company. I cannot change hardware or software settings in Chrome or the Internet Explorer. Also it can take a long time to load everything. What I wanted to indicate is that the reference library comes to its limits if you select all apps at once. It might work on power machines however we should not create documentation websites which depend on the performance of a quite current computer. Maybe you can integrate a function to just download all aggregated information via one click without loading / displaying the data? (e.g. define a filter for the apps and then download all docs as simple file extracts?) This would probably help. Anyways: Thanks for lib at all – this makes Fiori life a lot easier. for a faster alternative to locate technical information into the reference library. (only runs in chrome / edge, not ie). Thanks Maricel for this helpful clarification – trust this clarifies some of the questions in the community. Having all the SAPGUI/WDA information: good. Having all in one bucket: bad.